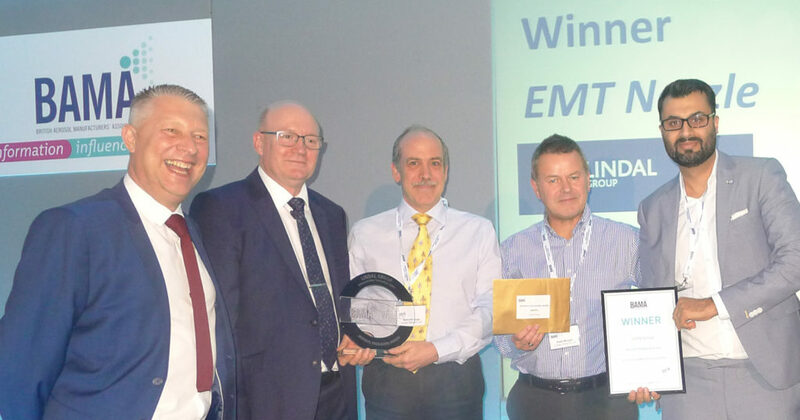 Leading aerosol dispensing company, Lindal Group has picked up the prestigious Aerosol Packaging Award for its Enhanced Mist Technology at the British Aerosol Manufacturers’ Association annual forum. The company, which manufactures spray caps, valves and actuators for different types of aerosol products, collected the award at the BAMA 2018 awards ceremony held at Oulton Hall Hotel in Leeds on Tuesday 16th October. Lindal’s EMT is a versatile, two-parts insert capable of producing improved fine mist spray performance and facilitating a new integrated molding and assembly process. Purposely designed for low viscosity products like water and ideal for facial skin care mist, EMT is also operational with compressed air, as well as dip tube valves or Bag-on-valve systems. Producing a quiet and soft sound, EMT technology also achieves a better spray performance with water-based products, reducing Volatile Organic Compounds (VOCs) which helps to improve indoor air quality. EMT can be used with any standard actuators and is ideal for a number of different personal and homecare applications, including facial mist and air freshener.